A tiny warrior he is. Honestly he was really struggling to find an armour to fit for his seize but when he did he was proud like nobody else. 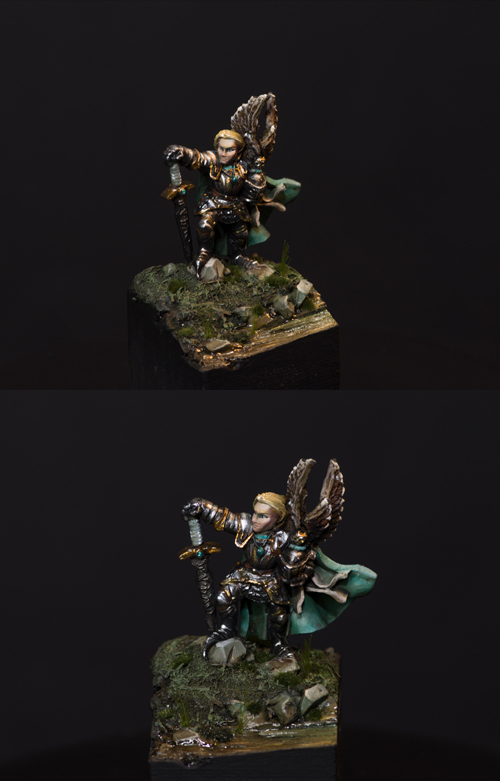 This is a small figure from Demonworld in 15mm Scale that I have painted as a little gift to a kind person and friend who helped to organise the last painting class in Karlsruhe. There was no roomcharge and the only thing that Andreas asked for was a "kind offering in any form" for the use of his film studios. This was my answer ... really tiny, but from the heart. Let me know what you think of him? Don't forget to vote for the next tutorial article up to MV!! And never surrender, keep on happy painting! I just bought this one as well. I totally love the paint job, as well as all your other small scale minis! 15 mm is a great scale, you can do so much in such little space. There are a lot more good sculpts available than there once were, too. This is excellent work. This one came with the "Demon World" PC game, I think.